A view from Ocean Creek at Fripp Island Resort. Scenic Ocean Creek Golf Club was a hit from the start. The golf course, designed by PGA Champion Davis Love III and Paul Cowley, was opened in 1995 and was named as one of the 10 best new courses in America by Golf Digest. 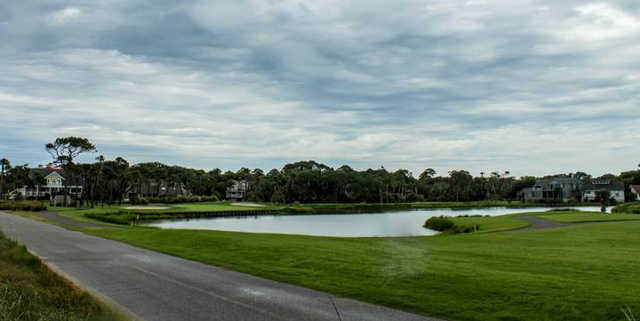 Ocean Creek incorporates sweeping views of saltwater marshes, freshwater lagoons, lush jungle vegetation and four distinctive rolling dune ridges. It attracted movie producers to film scenes from "Forrest Gump" and Disney's live action version of "The Jungle Book." The signature par-3 sixth (143 yards) and par-4 seventh (394) holes are situated on the Old House Creek and marsh. Five holes are edged by marsh, while another six incorporate interior wetlands, preserved and connected to the course through a network of wooden walkways and bridges. Ocean Creek Golf Club is home to a wondrous variety of wildlife, including egrets, osprey, herons, deer and even an occasional alligator basking in the sun. The golf course features five sets of tees including the wee-links tees that make the course enjoyable for all skill levels and a fair challenge to the advanced player. The wide fairways and large greens offer enticing targets, but stray shots can lead to many problems.